Just finished a 36-hour stint in Raleigh. Between fine meals at Sammy's Tap & Grill with NC State legend Derrick Whittenburg, and a late dinner at the legendary Amadeo's, there was a basketball game. The Wolfpack beat up on Florida State with a number of outstanding performances by a deep and talented squad who picked up their 19th win. They're looking to better a Sweet 16 season a year ago, and with monster efforts like 31 points and 13 rebounds from freshman T.J. Warren, they've got a shot. Another one of the highlights of the trip was working with a college buddy as my play-by-play guy. To think, 20 years ago I was pouring beer on the kid when he was pledging the fraternity. Just goes to show you, you have to be nice to everyone. But a trip to North Carolina on a sunny day (at least it was when I got there) makes me think about one thing: Wine. Huh? 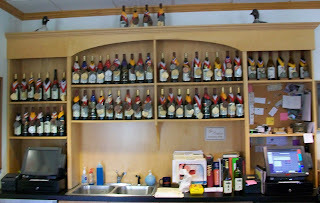 I took one full day on the road hitting my favorite regional winery. Time well spent! Raylen Vineyards is one of the jewels of the very underrated North Carolina wine country. Now it's not Napa or anything, but it's very good, well-priced, and well-decorated. 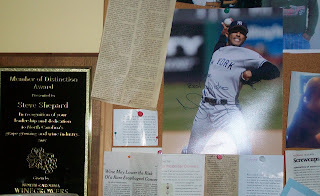 Any winery that Mariano Rivera endorses is one that I could set up a cot in. I'd just wait for his arrival so we can discuss whether he prefers the 1996 Yankees or 2009 Yankees while we share one of Raylen's unique red blends. When it was time to go, I loaded up the trunk to transport the alcohol back across state lines. Now I'm no professional bootlegger, but I'm told this is how Nascar got started in these parts. Guys who were transporting moonshine had to drive very, very, very fast. I took it a little slower. And when I got home I uncorked one, and took it even slower than that.